Do you Have Appropriate Insurance on All of Your Valuables? Unexpected events happen in life, and sometimes those events can be setbacks to our financial situations. Unfortunately, they can sometimes result in financial ruin. Occasionally, it is important to consider how our homes, autos, boats, motorcycles, RVs, and other valuables are covered in the case of damage or theft. 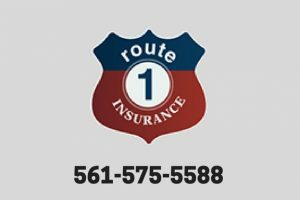 Here at Route 1 Insurance, we would be glad to give you a free consultation on your insurance coverages and needs. Our objective always is to establish long-term relationships, so we work hard on client relations and communication. Courtesy, respect, professionalism, and kindness are hallmarks of how we operate. While providing great insurance policies is the main focus of our business, it is our level of customer service that keeps clients returning year after year. Since we are an independent insurance agency, we are able to compare offers from many different insurance carriers who want to compete for your business. This keeps you from paying too much for the insurance you need. The end result is more value and more quality for you. With over 20 years of experience serving customers in the Tequesta and Jupiter areas, we have the knowledge and experience to find insurance policies that match your unique circumstances, and meet your needs, at a price you can afford. Our experience sets us apart, and helps us serve your better. When it comes to understanding the insurance markets, and how to get quality coverage for a great price, there is no substitute for experience. As we work with you to find the coverage that you need, we are available to discuss any questions or concerns you might have. We offer personal and commercial insurance coverage, including: home, automobile, truck, condo, flood, wind, property liability, umbrella policies, and more. We have been proudly serving the Tequesta and Jupiter area for over 20 years. Our office is located at 222 U.S. Hwy 1, Suite 6, in Tequesta, Florida. We are open from 9:00am to 5:00pm Monday to Thursday, and 9:00am to 3:00pm on Friday. Do you have questions about our services? Or would you like a free consultation? Give us a call today: 561-575-5588. We want to be your trusted partner for your insurance needs. We look forward to speaking with you soon.